This morning we took part in the liturgy in the parish of the Icon of Our Lady, Joy of All the Afflicted, presided by Metropolitan Hilarion. 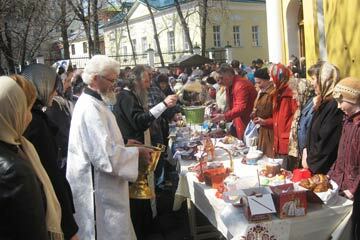 "Holy Saturday Liturgy – Great Saturday in Russian. The church is still immersed in grief. The dark clothes tell of this, reminding us of the fate of Christ on the Cross throughout Lent. But the moment comes when something changes. The priests come from the altar to the people clothed in white instead of black. All the church changes – the dark clothes are being changed into white ones. Women remove their black head-scarves and replace them with white ones. An old woman in the church choir explained this moment to a girl who was gazing in amazement at what was happening: ‘Today the Lord sleeps. His sufferings are over. And tomorrow, Paradise will be opened. And hell will be opened as well!’"
The moment that Olga describes, when the priests change their vestments from black to white, was perhaps the most moving moment of our pilgrimage so far. Beforehand, several readings from the Old Testament, each giving a sign of God’s liberating action and prefiguring the Resurrection of Christ, were sung by clergy and lay people. And then comes the Gospel reading of Matthew 28 - suddenly the Resurrection is there. Quietly at first - the proclamation comes later. But that presence is already there. Like for Mary of Magdala and for the disciples, it will take some time yet for us to experience it fully, but it’s there. 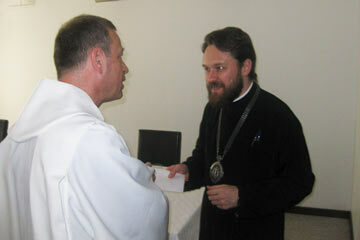 After the liturgy, we were warmly welcomed by the Metropolitan. The pilgrims staying in the parish, looked after so well by members of the youth group, have been made to feel at home. And the parish youth expressed their joy in being able to offer hospitality in this way. Olga writes: "All through Saturday, many people direct their steps towards the church for the blessing of their Easter meal – Easter cakes, eggs, paskhas. The priests sprinkle the offerings with holy water during the singing of “When you have descended to death, Life immortal…”. Red candles are lit and placed to burn in the Easter cakes and paskhas. The approaching Feast can be felt in the air." It is extraordinary to see this expression of popular faith. Such things were impossible not so long ago. In the city parishes, people hand out leaflets to explain the real signification of Easter, but it is hard not to think that this re-emergence of religiosity will lead in time to the renewal in faith. This afternoon, beautiful workshops. 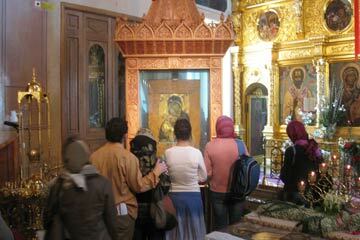 A pilgrimage from church to church in the city centre, to venerate the shrouds of Christ in the tomb. Several groups set out on different routes. 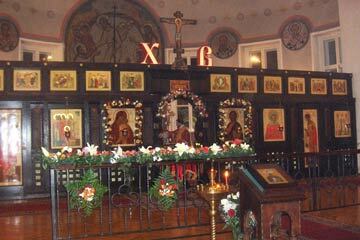 In the church attached to the Tretyakov Gallery, a talk was given on the Icon of the Mother of God of Vladimir. At another location, songs were learned for the night service. There would be so much more to write, but it’s time to set off for that Easter night service, which begins at 11.30pm. Will be back at six in the morning! A quick rest after the workshops, before setting out for the midnight service at St Tatyana Parish. In each of the six parishes welcoming pilgrims, this service is really the high point of the pilgrimage. When we arrive, members of the congregation are already reading from the Acts of the Apostles. The whole book is read throughout the day. Everything is peaceful. All are waiting: waiting for what they know will come. At 11.30pm, everything begins. Olga writes: "Darkness in the church. Worshippers stand in silence holding lit red candles. Before this, all who wish read from the Acts of Apostles one after the other. The reading fills already the church with the anticipation of this incomparable Feast. Unforgettable moments. People kiss each other three times, exchanging the Easter greeting: “Christ is risen!”and replying “He is risen indeed!” Right up to Ascension day, the Easter greeting is used in the place of the usual greetings. A sea of lights, red candles, exultant faces. The procession flows through the doors of the temple. The church is flooded with light. The clothes for Easter are red, and the priests are clothed in red. The beginning of Saint John’s Gospel sounds out in languages ancient and new: “In the beginning was the Word…”"
This was a most incredible experience. To hear those first words spoken tentatively by the priests behind the iconostasis and then repeated louder, until the proclamation resounds in the church, lets the reality of the Resurrection enter gently and then take its full place in our lives. the angels praise with song in heaven. may glorify you with a pure heart." Again, who could have imagined such things not so long ago? If this is not a sign of God’s action, then what is? Our young pilgrims join the congregation, picking up the words of the song as they go. 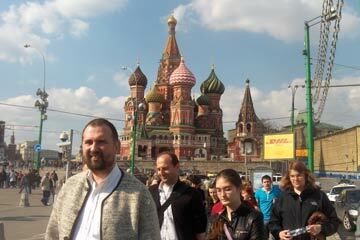 As we reach the main door of the church, the procession stops and the priests cry out "Христос Воскресе!" Christ is Risen! In one voice, the response comes "Воистину Воскресе!" He is truly risen! An explosion of joy. Everyone is smiling. We re-enter the church, which is now flooded with light. And the number of times this greeting is exchanged during the service is beyond counting. But one thing I notice is that every time I respond, I know that I am saying something that is true. The Resurrection needs to be announced in order for it to penetrate the depths of our heart. The understanding can never be purely intellectual. The priests take it in turn to give the Easter greeting and then race around the church censing as they go. And they change the colours of their vestments - white to green to blue to gold to red, as if the Resurrection transforms everything that we see, hear, feel, experience. A new creation is brought about. And at the end, after the celebration of the liturgy, everyone takes part in a festive meal. We are tired and that our legs ache, but what joy, what thankfulness for the kindness of our hosts and the beauty of this worship.